Nevertheless, when Coffee Review decided to follow up on last year’s cupping of New York area coffees, the Pacific Northwest seemed a logical next stop on the tour. In this article, we review whole bean coffees from the Pacific Northwest intended for brewing in drip or other non-espresso formats. Later this month, we sample Pacific Northwest espressos. 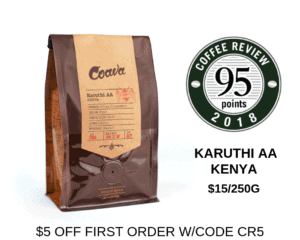 For this review of non-espresso format coffees from the Pacific Northwest I cupped forty-five candidates, all whole-bean, some sold in bulk and some in valved foil packaging. All samples were purchased retail on a random basis from stores and websites operating out of Seattle, Portland, and stops between and around. Of those forty-five coffees the twenty highest rated (or most interesting) are reviewed here. Based on this relatively small sampling, what can be said in general about whole-bean, non-espresso-format coffees from the Pacific Northwest? Note that there was not one unqualified medium roast among these forty-five Pacific Northwest offerings. Apparently those coffee drinkers who crave bracingly acidy, old-fashioned medium roast coffees a la Dunkin’ Donuts or Green Mountain need to move East or resort to mail order. Although all of these Pacific Northwest coffees were roasted to various degrees and qualifications of dark, I felt that, by and large, they were impressive dark roasts, achieved with skill and tact. Only three or four were the kind of terminally charred ultra dark roasts that taste like licking a board from a burned building after the fire fighters have gone home. On the other hand, my reviews of these coffees may sound a bit monotonous, given that I am usually describing subtle differences in the impact of roast on the coffee rather than the often more dramatic differences generated by the green coffees themselves when brought to a medium roast. I frequently (perhaps too frequently) used the term “roasty,” for example. By roasty I mean the pungent but caramelly, bittersweet flavor complex given coffee by a careful dark roast, a roast that mainly browns the sugars in the bean rather than burning them. By “roasty” I do not mean burned, by the way. Burned is burned, as in tastes like burned wood. “Roasty” – pleasant bittersweet pungency generated by moderate dark roasting. “Gently roasty” – pleasant bittersweet pungency generated by moderate dark roasting with more emphasis on sweet than bitter. “Cleanly roasty” – pleasant bittersweet pungency free of excessively bitter, charred or rubbery notes. “Massively roasty” – the roast dominates the coffee in a big, monolithic fashion, but not unpleasantly so. ” Balanced acidity and roastiness,” or words to that effect, means I tasted both the pungent flavor developed by a moderate dark roast and the sweet tart sensation (acidity) typical of lighter roasts. “Tactful roast” – opposite of aggressive roast, meaning the roast tasted as though it was achieved deliberately enough to avoid premature burned notes or sharp bitterness. ” Burned” – literally tastes like charred wood. This sensation, typical of very dark “French” roasts, is a much loved sensation for some coffee drinkers if it stays clear of rubber and soggy burned building notes. Based on this small sampling, Starbucks – famed or blamed as the national popularizer of dark-roasted coffees – appears to roast its specialty whole-bean offerings considerably lighter than many of its Pacific Northwest competitors. This apparent paradox should be no surprise to anyone who actually tastes American specialty coffees rather than generalizing about them. Starbucks has been moderating its roast levels in its whole bean menu for some years now, whereas many of its smaller competitors have been roasting darker and darker, perhaps in an effort to out-Starbucks Starbucks. True, Starbucks espresso and its house blend still taste mildly burned most of the time, as did the organic Sumatra reviewed here. Nevertheless, I would argue Starbucks deserves considerable credit for its efforts to preserve and excel in that tiny, tiny part of its business still devoted to specialty whole bean coffee. After all, Starbucks is a corporation that long ago could have turned itself entirely into a chain of coffee flavored malt shops for grown-ups, probably without losing a nickel for its stockholders. But someone at headquarters appears determined to keep plugging along with specialty whole bean coffee in the face of a customer base made up largely (it would seem) of herds of latte lappers and straw-sucking frappuccino lovers. For this cupping, the payoff for that perhaps anachronistic effort are two excellent specialty coffees from Starbucks, an organic blend and a Guatemala. The Serena Organic Blend came close to being the highest rated coffee in the review, prevented only by a slight unevenness among the five cups I sampled. The Starbucks Serena blend took second place in the ratings to a wonderful Ethiopia Harrar from Hood River Coffee, which I felt hit the optimum sweet spot for dark-roasted coffees, simultaneously expressing both a subtle dark-roast character as well as the excitement of a fine and distinctive origin.